"What a strange thing to find on a site dedicated to Peace ..."
Permit me to attempt an explanation. At right is an image from the World War II period of human history. These two men are inside a B-17G Flying Fortress, the final version of this aircraft. 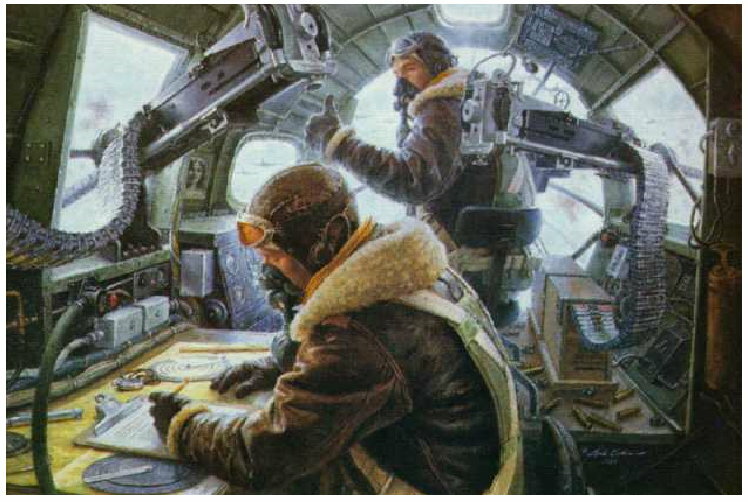 The seated crewman writing on his clipboard is the Navigator, and the one up front with his thumb in the air is the Bombardier. Both also doubled as machine gunners as this image also instructs. 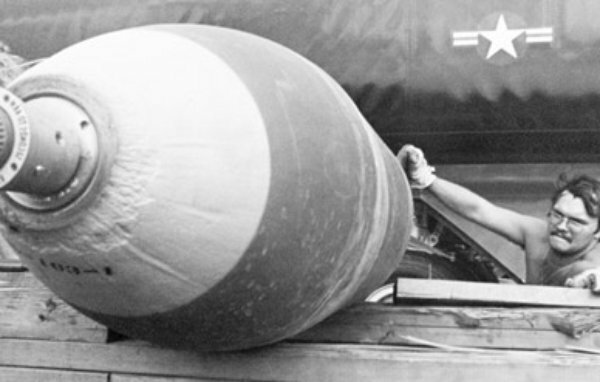 It's "armament" was 4,800 pounds of bombs (2,200 Kg), its "payload." Ammunition for the guns was 11,000 rounds. Whether the Bombardier's "thumb's up" here means "Bombs Away!" one can only guess or assume. The point of the aircraft was to participate in bombing runs over enemy territory. This of course, involved a flight plan and a targetting process, and a detailed list or checklist required by the complexity of such a mission. This assured or promised the best outcome possible in a setting of uncertainty: the uncertainty being the enemy's intentions to shoot at these men and the others of their crew, from the air and the ground and anywhere in between, on any given day. "Yes, that's war, and we don't want any part of it..."
So since their job was to bring and dispose of (drop) bombs, after that was done, the task at hand became a swift (since their visit was not welcome) and safe return to their home base airfield. So "Bombs Away!!" also signalled the pilot, paraphrased politely here: "Let's get out of here and go home!" While not always an easy return trip if angry enemy crewmembers decided to shoot them down, "Bombs Away!" = "Let's get out of here!" was a good start. It signalled that the key "inbound" objective of the mission had been met, and the moment for "outbound" return was at hand. Events tied to these trips in both directions are the subject of war books, and war stories. The lives of these crewmen were marked forever by their encounter with uncertainty, the unknown and unknowable. As alluded to elsewhere, trying to make an argument that bombing places where humans are standing (some soldiers, some citizens) can be discussed from the perspective of a question : "Does bombing humans ever do any good?" Many would answer: "Yes. You bet." The value judgements associated with this reply are couched in always difficult and not infrequently, simply wrong perceptions. If most of the world is in agreement that down below is a hideous monster of a dictator, guilty of all the atrocities war can inflict, a great deal of support worldwide can at that moment be found for: "Bomb him and Blow him to Smitherenes!" ("Smithereens" first appeared in English in 1829 in the form "smiddereens," and most likely was borrowed from the Irish "smidirin," meaning "small bit or fragment."). The decision to bomb a country and its occupants and resources arises of course, in complex sets of evolving circumstances and decisions. These circumstances depend on facts, "intelligence," fiction, propaganda, and world views that are at times : wrong perceptions. The two men in the picture appear to be still in a "so far, so good" situation and physical state. Those on the ground, about the time that the Bombardier's thumb went up into the air, or shortly after, may not have been able that day, to say the same. Even though "War Is Hell !" - men persist in it. So effectiveness may depend on which side of the bomb bay door one finds oneself on. To get the feel for these positions, I like to call attention to the "Christmas Bombing" of Hanoi and surroundings by B-52's at the end of the war in Vietnam. History has to put such events in perspective. 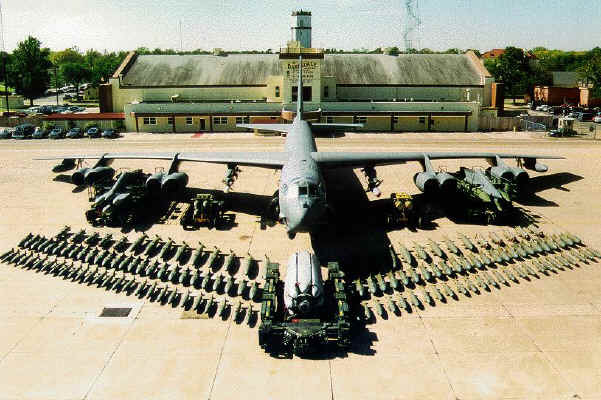 "Rolling Thunder" a B-52 at AAFB on Guam. History suggests that these raids are a bad example, if one is trying to support an argument for indicated and effective bombing. You can read about this bombing of Hanoi here, and a combined and intriguing summary of observations from those in the air, delivering, and those on the ground, receiving, by Marshall Michel, here. For a more complete view of the Love/ Hate relationship with B-52's by those who fly them still today, click here. A second interpretation of "Bombs Away!" So far, this article doesn't sound very tied to the usual message that you might read at SendThemPeace.com But the words themselves of course suggest another thought or interpretation. One might paraphrase this as: "Take that bomb of yours and get it out of here! Take it very, very far away! Now!" Perhaps one can imagine an elderly pacifist school teacher saying something like that out on the tarmac at Anderson Air Force Base, to the fellow loading this device. "Get it out of here, or you're in big trouble, Mister !" SendThemPeace.com is not concealing any missile silos or bombs in its basement. The message here remains that through an effective implementation of The Challenge, bombs and other horrible instruments of destruction, like automatic weapons, will in fact become unnecessary. Pointless souvenirs of a bygone age of fear. And at that point, and as we see them disappear, we will be able to joyfully lift a thumb and shout: "the Bombs (have gone) Away! " That message doesn't require more explanation. This one does : The idea of Targets for The Challenge, does arise in the same language of war. The selected Targets at SendThemPeace.com are targetted for only good intentions and right perception. Not with 500 pounders. The energies we seek to deliver are those of Peace and Compassion. While confident of the effectiveness of even a single, small, whispered intention of Compassion ..., is a mass effect more effective? Rudely put: "Let's Peace and Compassion them to Smittereens!" Can that be more effective? If one Butterfly beating its wings, has a quantum effect on waves on the other side of our world, how about 10,000 Butterflies?" How about 10,000 visionnairies, practicing SendThemPeace and The Challenge at the same time? For 20 minutes each day. Day after day. More effective than a solitary monastic intent on the same Target? We'll see. This "mass effect" is what was referred to in the introductory article on the Home Page. ["So How Can Compassion Win? Only Through A Mass Effect."] Perhaps this reveals an impatience that is more akin to what motivates wars than Peace mouvements. Perhaps this is "wrong perception" once again, because human thinking is simply prone to that: like comparing payloads of the B-17G and B-52. Then again: perhaps not. Those bounded by Body+Thought materialism may reply: "Send them 10,000 real troops or 10,000 real bombs in real ships and real flying fortresses, and just get this over with." Those who courageously add back Spirit to the composition of humanity [Body+Thought+Spirit], might be our candidates for flying with SendThemPeace.com and The Challenge. We certainly think so. Up to us all to identify these truly courageous souls. Caution! Military Terms to follow : To avoid diluting this "bombardement" using Peace and Compassion "bombs", specific areas of Peace deficiency are : Targetted. This makes it less likely that any of the 10,000 Butterflies will get lost either "inbound" or "outbound." Or that the good intentions sent towards "A," will be mistakenly sent towards "B" by a practitioner who has become a bit lost in the fog of Spritual Travel. In other disciplines, such as Medicine, outcomes are used increasingly to determine effectiveness. Such studies seek to display a certain "statistical power" invariably helped by adequate numbers of studied entities. How nice it would be to observe a similar effect from meeting The Challenge. Much more importantly, how nice it would be to see Peace through Compassion, flourishing. A true monastic may quietly respond that he does not need such "proof." That if faith is small, results may be small. So work on faith. Others: faith the size of a mustard seed moves mountains. Such sentiment supports the effectiveness of a hermit's practice. This should not devolve into arguments about numbers of angels dancing on heads of pins. I admit that my practice is far from perfected. It has clearly been shown that group meditation is a perceptibly different energy experience. It's why monastics in all traditions gather together. Will The Challenge have this effectiveness? Let's hope so. The Scientific Method is intimately bound to making measurements of phenomenon. What can be measured that could be bound to The Challenge? Perhaps over time, a country's ranking on the Global Peace Index. Open to other suggestions. Clearly, preparing information about Targets, and scheduling a specific time globally for intervention, clarifying "Time On Target" should help the human participants in The Challenge to participate more fully, more effectively. The non-Peaceful ring to the words, are just words. They are not the actions. So review your pre-flight checklist of where we're going and how to get there, and climb aboard this flight for 20 minutes each day, and SendThemPeace. ... nonviolence is not passivity but a wholly different way of struggling against injustice and violence. It takes as much discipline and planning as military options. It offers a markedly different way of power and a much broader menu of tools and tactics than those available to military force.